My “To-Do” List from 25 February. Note I didn’t check off “Product Document!” I probably should break that item down into smaller tasks. I found an incredible way to increase your productivity, instantly. Before you begin your workday, sit down and clear your mind. Take out a piece of paper. Write down all the things you want to do. Then look at your list. Ask yourself, “Which things on this list, if I take action on them TODAY, will best help me to achieve my goal(s)?” The things that are most important will jump out at you immediately. Put a star next to the super important items. Then work from your list all day. I’ve found that working from a list not only helps me to prioritize, but it also prevents me from wasting time on anything not on the list. When I’m done with one item I just look at the list again and decide what’s next. Work from a list and I guarantee your productivity will increase by 40% instantly. You’ll get more done in less time. 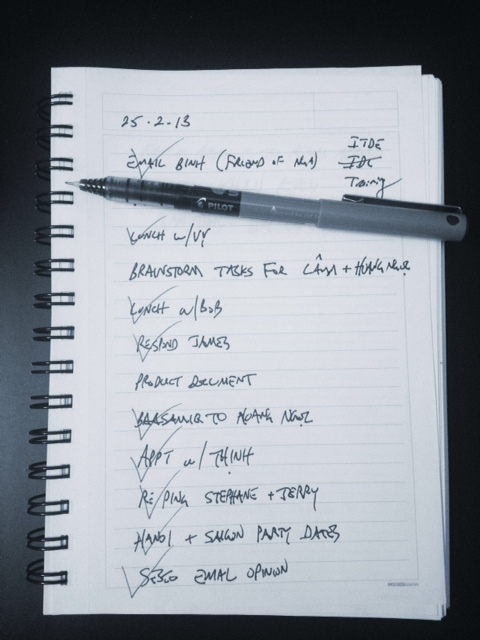 PS – My understanding is this works even better if you write your list every night before going to sleep. Then visualize yourself doing each thing on the list. When you wake up your brain is primed to begin work without wasting time. Anyone want to try this with me? I’ll post the results in a week or two. I will start tomorrow morning, Monday. I am wondering, would it make a difference if it was on an iPhone App or in an actual physical notebook? I hate carrying more things than I need… but this may be worth getting a mini Moleskine for. I think this is a matter of personal preference. Try both. I like a small notebook, maybe because I take huge satisfaction in checking things off. it always works for me. i use highlighters to add colors to it. Greens for done and are truly uplifting. How do you prioritize it, Chris? Is the most important one at the top? I usually put a star next to the most important ones. Then I make sure I do those first. Sometimes I might do a super minor but quick task first. I find that helps get the momentum going. I utilize the similar concept based on David Allen principle called “Getting Things Done”. It’s a quite effective, and when you realize this concept with the http://www.Rememberthemilk.com it’d save much of your time. The productivity is increased a lot :). Thanks for the tip Tuan.